Gordon Marino’s talk entitled “Seven, Eight, or Nine Upbuilding Lessons that I Have Taken from Søren Kierkegaard,” has been rescheduled for today at 2 PM in the Hannah-Ford Room of Bondurant. 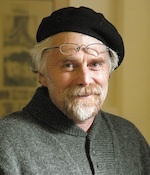 Dr. Gordon Marino, Professor of Philosophy at St. Olaf College (Northfield, MN), will give a talk entitled “Seven, Eight, or Nine Upbuilding Lessons that I Have Taken from Søren Kierkegaard” Today, February 27 at 2:00 PM in Bondurant 208C. In addition to courses on the Danish philosopher, he also teaches the history of philosophy and philosophy of religion, and serves as Curator of the Howard V. and Edna H. Hong Kierkegaard Library. He received his PhD from University of Chicago, an MA from University of Pennsylvania, and his BA from Columbia University. An insightful public intellectual, he has published articles in American Poetry Review, Atlantic Monthly, and New York Times Magazine. He is author of Kierkegaard in the Present Age and editor of The Quotable Kierkegaard, one of The Wall Street Journal Bookshelf Best Books of 2013.